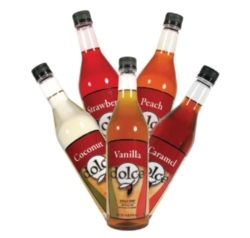 Life is sweet with Dolce Classic Flavored Syrups. Oh, and any beverage too! Comes as a case with four 750ml plastic bottles, flavors of which can be chosen below. $0.20 / oz. $0.19 / oz. $0.18 / oz. $0.17 / oz.